Challengers Approaching! New Foes Have Appeared! Well, here we are. Super Smash Bros Ultimate has arrived at long last. I truly cannot wait until I can get my hands on the game. The newest entry in one of my favorite video game franchises next to Pokémon has gotten me thinking, if Luna, Terra, and Sol were real Pokémon games, then how would they be represented in Smash Bros? If you’ve wondered the same, then wonder no more. The answer is here. 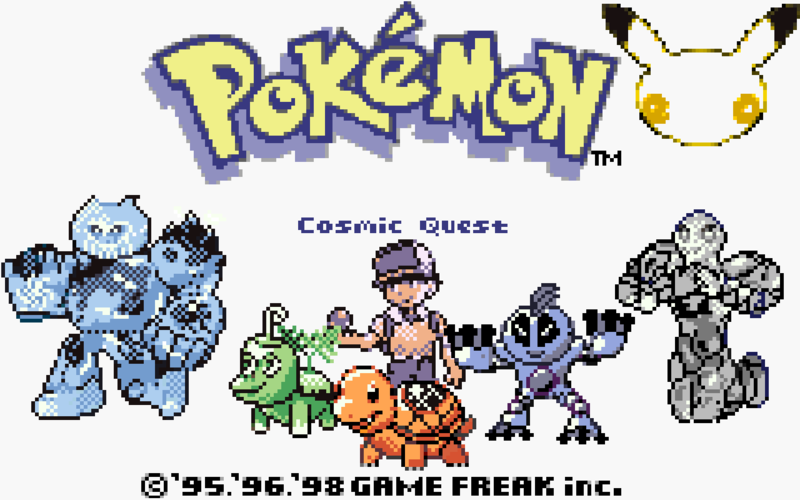 Given how important Legendary Pokémon are to Smash Bros, I find it quite surprising that we only have one Legendary Pokémon as a playable character in the games with Mewtwo. The reason for this almost certainly boils down to the fact that most Legendary Pokémon are not humanoid in shape (which may not be a requirement for Smash Bros, but certainly helps) and too big. Of course, Ridley has now proven that size can be negotiable. With that, I propose these two new characters for Smash Bros.
B: Brine: Terratlas attacks with a pulse of water from its body. As Terratlas takes damage, this move increases in power, size, and range. Down-B: Earthquake: Terratlas stomps the ground, creating an earthquake in the vicinity directly around it. This will stun and cause damage to any opponent in close proximity. In addition, this will cause a minor amount of damage to opponents standing on the same floor as Terratlas. The damage at a distance caused by this attack decrease each time it is used. 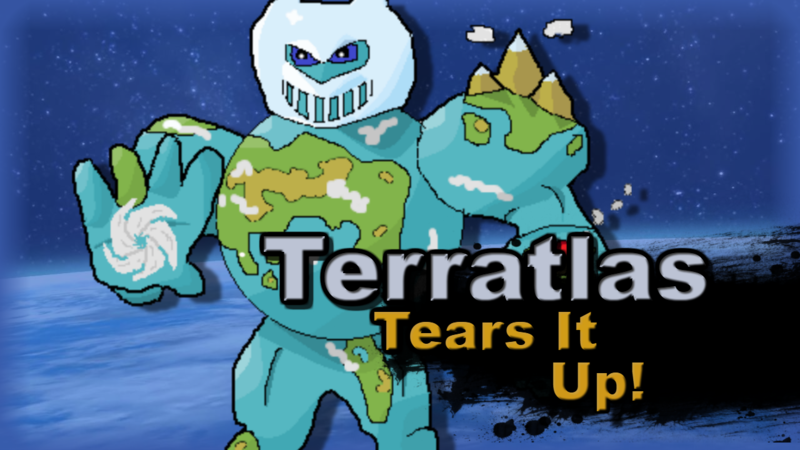 Side-B: Earth Power: Terratlas causes the ground in a line of sight of it to erupt. The attack is slow moving, but has very strong launching power if contact is made. Up-B: Seismic Toss: Terratlas leaps straight up in to the air. As it travels upwards, if it contacts any opponent, Terratlas will grab them. Once at the peak of the jump, Terratlas will hurl the captured opponent straight down. 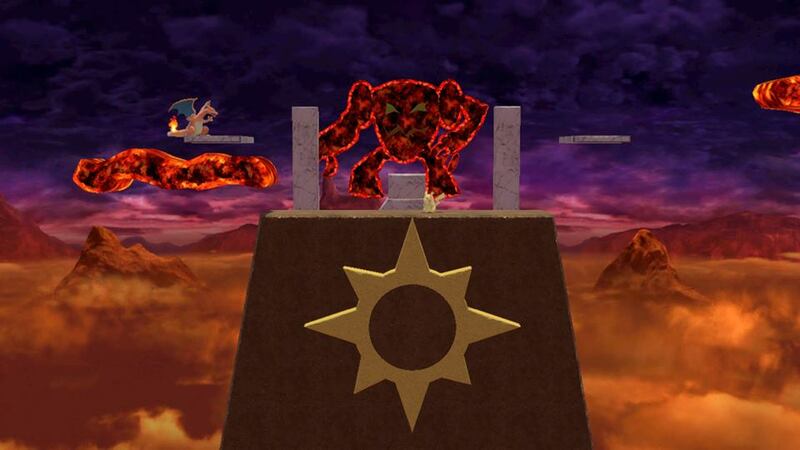 If used over a ledge, the opponent can recover, but only if they act fast. A Attacks: Various basic attacks that aren’t worth detailing. Side-Smash: Blizzard: Terratlas summons a short ranged blizzard. At full charge, it might freeze the target. Up-Smash: Geyser Strike: A forceful jet of water is sent above. Longer range the longer it’s charged. Down-Smash: Seismic Manipulation: Attacks the ground beneath it powerfully. Final Smash: Firma Force Of Nature: All it once, a rain, hail, and sandstorm begins. Terratlas leaps in to the air and absorbs nature’s energy all around it, then slams downwards in a semi-controllable trajectory that results in a shock wave. Afterwards, the weather created lingers for a period of time, during which Terratlas’ B attacks are powered up. Seluna, while being quite tall, would be much more agile than most of the larger characters. It’s moves may be weaker than Terratlas’ because of this, but Seluna can still pack a punch. B: Lunar Beam: Seluna attacks with a beam of shadowy energy. The attack can be charged, and the longer it’s charged for, the thicker the beam, longer, and more powerful the beam will be. Down-B: Moonlight: As long as the button is held, Seluna will slowly heal over time. Side-B: Moonblast: A phantasmal moon appears above Seluna, and aims an attack at the closest opponent. The attack has little to no knock back, and doesn’t o the most damage, but will almost always hit. Up-B: Stone Edge: Seluna causes rocky spikes to jet out from beneath. These spikes will cause damage and knock back to anyone they hit as the emerge, and fling Seluna up into the air. If used on the ground, these spikes will linger for a short period. or until the move is used again. Anyone besides Seluna that touches these spikes will take minor damage. A Attacks: Various basic attacks not worth detailing. Side-Smash: Nightstorm: Seluna attacks with a snap of dark energy right in front of it. Up-Smash: Ancient Power: Seluna hurls power-infused boulders straight up. Down-Smash: Night Shade: A pulse of shadow emanates downwards from Seluna. Final Smash: Apogee Tidal Power: A massive full Moon appears in the sky and Seluna calls upon its energy in order to attack with a massive beam of silvery lunar energy. 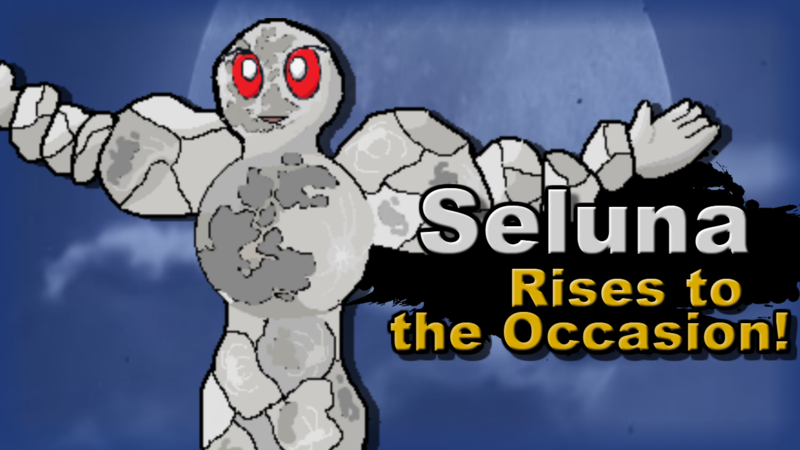 The full Moon lingers for a short period afterwards, powering up all of Seluna’s B moves. Now, you’re probably wondering, what about Heliosol? 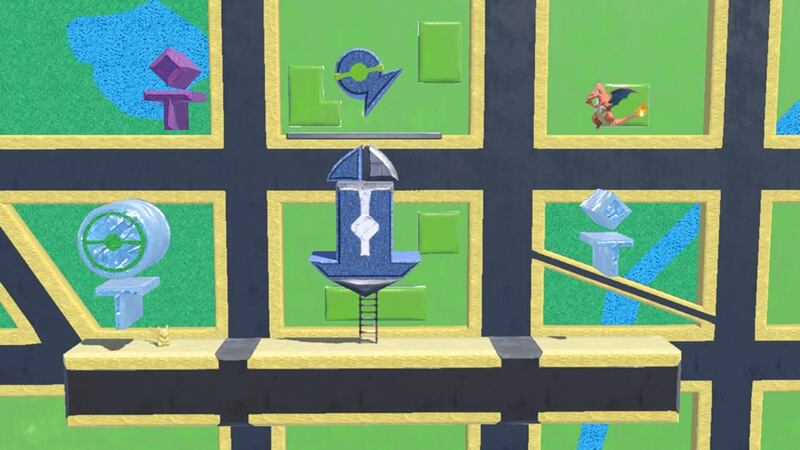 Well, we also need a new stage, don’t we? Let’s solve both those problems. 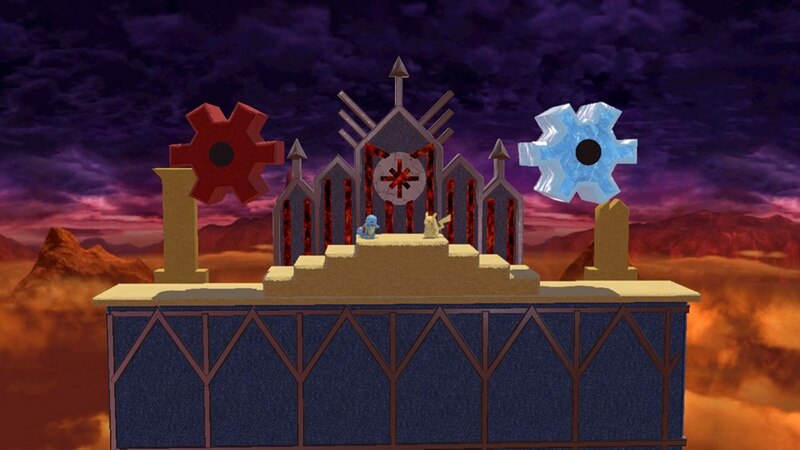 Solar Peak: This stage is set in Luna, Terra, and Sol’s Solar Peak Ruins, where Heliosol is found in Luna and Terra. The main floor of the stage is a raised altar above the rest of the ruins (the alter where you would encounter Heliosol). There are also two floating platforms, one over the drop-off on either side of the stage. Periodically, Heliosol will appear in the stage. It will randomly appear in its normal form or its Ascended Form. When in its standard form, it will stand in the background and randomly launch fiery attacks at the battlefield. But when it appears in its Ascended Form, it will join the battle as a boss. When it’s defeated, it will release a burst of fire and light that will cause damage to all fighters except the one who beat it. 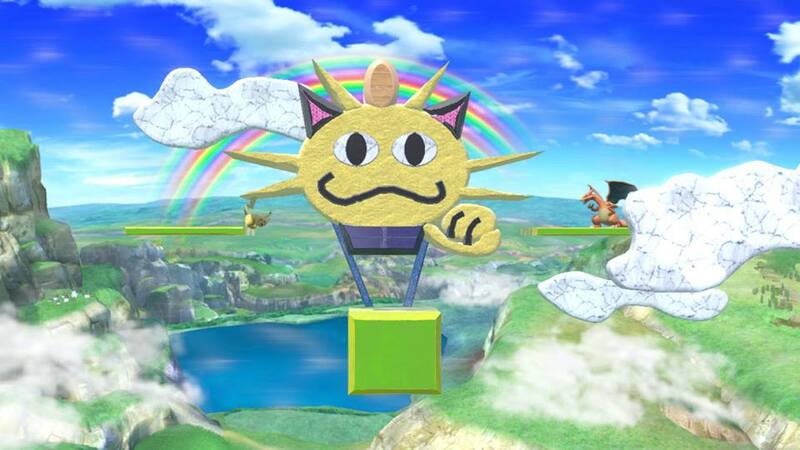 When Heliosol isn’t around, Sun-themed Pokémon such as Solrock, Solem, Volcarona, Heliolisk, Turcell, and Gigastar will appear at random in the background. They don’t do anything but stand around. Now, there’s one more way that Pokémon is represented in Smash Bros. Pokéball Pokémon. So, of course, there’s got to be some Tenno ones. Buffern: Buffern will follow the fighter who summoned it around the battle field, and use its ferns to shield them from certain attacks. Buffern will disappear either after a short time, or taking enough damage. Solurtle: Solurtle will use Rapid Spin and Heat Wave, attack around the field at random. Kappaqua: Kappaqua will stand in one place and hurl Aqua Bombs at anyone who gets near it. Calumba: The Pokémon will fly around the field, using Aroma Therapy to heal the fighters, giving a preference to the one who called it out. Noxic: Noxic will float around the field. Anyone who touches it will take damage over time for a short amount of time due to poisoning. Beetundra: Betundra will roll its snowball around the field, and it will get bigger the more it moves. If a player touches the snowball, they will be knocked away. The bigger the snowball, the bigger the knock back. Boodini: The magician Pokémon will disappear and reappear at random. Whenever it appears, it will attack. Gravisaac: While Gravisaac is on the field, gravity will randomly change between being more and less intense. Myoken: Myoken will guide the fighters to treasure, such as CDs or Trophies. And that’s it. Now enjoy all your smashing! The 20th Anniversary is Coming! Don’t think it ends there though, I have a lot planned for the coming month, including a very special way to celebrate on the actual day of the anniversary. 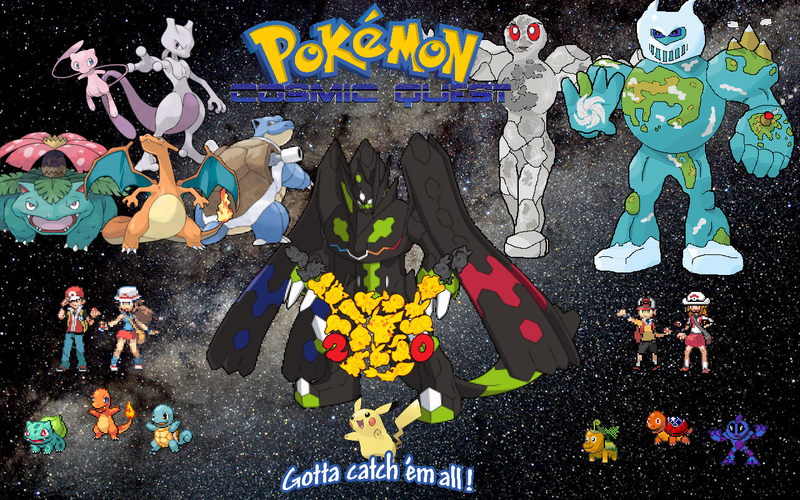 Never stop catching ’em all!